Welcome to the BESTNEST at 37 Shell Ring Road in Sea Pines-- just redecorated and super stylish! 37 Shell Ring is a completely comfortable and filled with every amenity that we appreciate when we vacation. The open living/dining area features 65” HDTV/BluRay/Netflix and comfy seating for 6. The dining area seats 6 comfortably and opens to a lake-view screened porch. Gaze over the lagoon while white egrets meander about. The kitchen offers everything you will need-- and want. All white dishes, great heavy flatware and cookware, baking and serving pieces, and spotlessly clean, nearly new appliances plus an adjacent grilling deck with gas grill await you. The master (king) is spacious and features wall mounted TV. The en-suite bath features double vanity, big tub, and walk in shower. Bedroom 2 features a queen bed and en-suite bath with tub/shower combination. Bedroom 3 features 2 twins and full bath with walk in shower. The spacious, detached garage is ideal for housing all of your “stuff”! HOW FAR TO BEACH: 5 minutes by car or 15 minutes by bike to the ocean/Sea Pines Beach Club. WHAT’S INCLUDED: Your property will come stocked with all of the household amenities you will need for the duration of your stay, including trash bags, dish soaps, perfume free laundry products, paper towels, bath tissues, hand and bar soaps and even Keurig AND standard coffee makers with filters/sweeteners. We also stock beach toys, beach chairs and umbrellas-- really, all you have to do is come and enjoy. Recently stayed at 37 Shell Ring with my wife, daughter, son-in-law, granddaughter and Westie dog. The house was very clean, and very well-equipped. Communication from BESTNEST was excellent prior to and during our stay. We were very impressed, and definitely will look at Beverly Serral property in the future. Great stay. We loved the layout of the house, especially the screened in back porch. We had a great time in Hilton Head. The home @ 37 Shell Ring was well appointed, clean, and had a convenient location. The porch was wonderful, spent much of our time relaxing out there. Would recommend both this home and Beverly Serral and plan to stay again. We’ve stayed in a number of nice places in Hilton Head, but this house went right to the top of the list. A beautiful house, immaculately maintained, well stocked. The property management folks checked in with us the second day to make sure we were satisfied with everything. And when we had to evacuate due to approaching Hurricane Florence the property management even followed up to provide all the documentation needed to file the trip insurance claim. We will definitely try to get back to this house on our next trip to Hilton Head. We've lost count of the number of Beverly Serral rentals we've had over the years, and we have never been disappointed. In fact, when we vacation in other parts of the country we often wonder who the "local Beverly Serral" might be as we know when working with her team we are guaranteed clean, well appointed lodging and terrific service. We certainly wouldn't consider renting on HHI from anyone else. We recently spent a week at 37 Shell Ring on a family vacation. The house was a perfect fit for our family of four and our dog. I couldn't have asked for better customer service, from answering all of my questions before our arrival to helping me find a dog walker during our stay. The house was clean and well stocked and met all of our needs. We didn't want to leave! very positive. The rental unit was clean, well supplied and comfortable for all of us. Especially enjoyed the screened in porch that was comfortable all day. The community pool was also appreciated.We have stayed in this little community before and enjoy the neighborhood for walking our dog. A little bit of a drive to Beach Club area, but we knew that ahead of time. As always, Beverly and her staff are the best. Positive and as expected from the information provided prior to our arrival. Enjoyed having the little things there and taken care of for us. Enhanced our experience. We rent every February and March. I need sunshine and golfing weather. The house is perfect; clean, well stocked with supplies, great location, and a 'workable' kitchen. HIlton Head is wonderful in so many ways. So is renting from Beverly. We enjoyed a fabulous week in this lovely rental house. This was our first time renting with Beverly Serral and we were impressed with all the "extras" she provides. From beach towels in the closet, laundry detergent stocked in the closet to yummy coffee and treats on the kitchen table. A very nice touch! A great Hilton Head Island stay! Thoroughly enjoyed our stay at 37 Shell Ring! The home is well maintained, exceptionally clean, and conveniently located to the beach, Harbour Town, and other Sea Pines attractions. 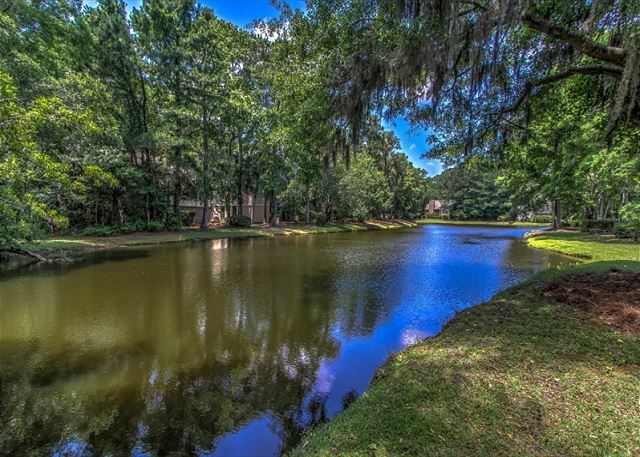 We have vacationed at various Sea Pines properties in the past, but will rent through Beverly Serral on all future trips to Hilton Head Island! This was the 7th annual use of this property for 5 of us as our home base for a week of bicycling on the Island. The condition of the house was spotless. The welcome amenities were appreciated because we did not intend to cook or clean during out stay. Most of our waking hours in the house was spent on the screened in porch when we were not biking. The proximity to the Greenwood Gate made it convenient to bike trails outside Sea Pines and to grocery stores. We had a wonderful time. The house was very clean and comfortable. It came with all the supplies we needed. We would rent this home again. We loved sitting in the screened in porch enjoying the view and watching all the animals . This home was great for both nature lovers and beach lovers. We had a wonderful stay at 37 Shell Ring. The home was spotless and we enjoyed every aspect of our stay. We have been coming down to HHI from Cleveland Ohio for 20 years and this was by far our best rental. The welcome basket was just so thoughtful. We will be renting from Beverly Serral again! Great house-great location. We really enjoyed staying there. Sea Pines seems to be our preferred location. The house was in great shape, roomy, and very nice bathrooms. Nice screened in porch I enjoyed with coffee and my laptop every morning! Very, very nice swimming pool in the community! This is our third year of renting from mid February to mid March. Cat rentals are hard to find but I sure am glad I found Beverly. These houses are terrific!! The kitchens have very nice pots/pans/dishes/glasses/etc., the bed and bath linens are wonderful, entire house is tastefully decorated, and very clean!! We are crazy about Chris and her crew-- so funny and great guests. I can say the same for them-- they leave all of our properties as though they weren't even there. They are signed up for 2017! Another great Beverly Serral Signature Rental!! We (along with our Tibetan Terrier)had another great October away from home vacation in Hilton Head. We have rented from Beverly for several years now and every rental has been exceptional, everything she describes about the property is absolutely accurate. 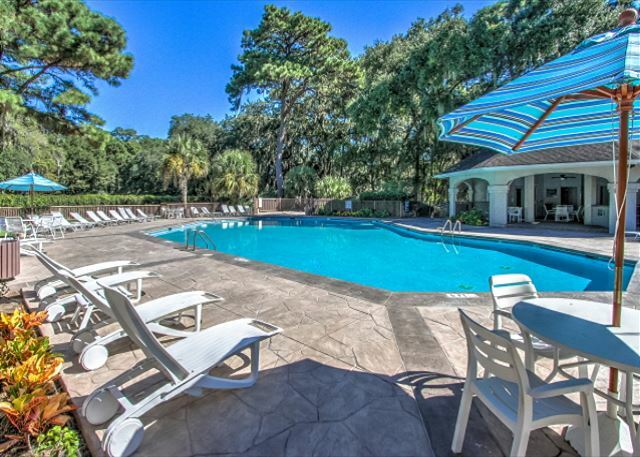 These rentals are the most clean and well maintained of any we have stayed in over the years we have been coming to Hilton Head. You will never be disappointed with Beverly's rentals!! Loved the welcome basket, especially the coffee for the first morning.Appreciated having available boogie boards. The numeric key-pad for the front door is a big plus. A rubber spatula would be welcome. Despite a well-intentionned set of TV-DVD instructions, I still found it confusing to use. All-in-all, a great place to stay for a lovely vacation. This was our first time vacationing in Hilton Head. We were very pleased with our experience! The entire process went smoothly and we were very appreciative of all the amenities that were included (especially the beach items). The house was very clean and matched the description. We will definitely rent from Beverly Serral for our future vacations! We had a great time and enjoyed this house very much. It was very clean and spacious. Beverly Serral's company were very easy to work with and provided great customer service. Thoroughly enjoyed our stay at this property. House was extremely clean and well maintained. Location to pool, beach and trolley were ideal. Area was quiet and loved having the canal in the backyard. Was very impressed with the quality of this rental and the amenities provided as well as what was stocked with the house. Would definitely stay here again. It was great. This is the 5th time we have stayed in this house. It is a wonderful house for 3 couples since it has 3 bedrooms and 3 bathrooms. We enjoy the quiet neighborhood with very little traffic. Our primary purpose of the trip is to ride bicycles on the many wonderful bike trails so the fact that it is not close to the beaches is not an issue for us. This is our third consecutive year renting from Beverly Serral but our first stay at 37 Shell Ring. We would never think of renting from anyone else! Because Serral properties are as advertised - very clean, comfortable and well-maintained. Any minor issues (such as trying to figure out how Netflix works) have been personally and promptly addressed by Beverly herself. We think Hilton Head Island (and Sea Pines in particular) is America's best kept secret: fantastic beaches, great restaurants, beautiful bike trails, the friendliest people you could imagine - what more could you want for a great holiday? And then there's the Wine Festival, Wing Festival, St. Patrick's Day Parade, Tanger Shopping ..... We've noticed a lot of people playing golf here but we honestly don't know where they find the time!